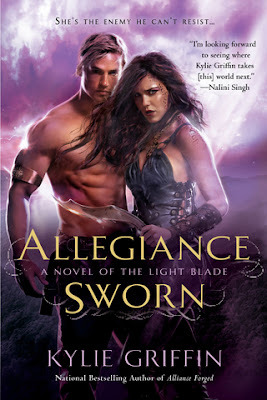 I've got a very special review today of Kylie Griffin's Allegiance Sworn. This is book 3 in her spectacular Light Blade series. This is a special review, because the book doesn't come out until next Tuesday, April 2nd. One of the perks of working in a library means you sometimes get book releases before they come out. You should have seen me on Friday when I opened a book box and found this! I was literally jumping up and down with excitement. And it turned out it was for very good reason! ***Spoiler Alert*** If you haven't read Alliance Forged, don't keep reading. There may be spoilers from the end of the book. Before I read Allegiance Sworn, I thought that it wasn't possible for anyone to be hotter than Varian. Oh boy, was I wrong. "Clean and clothed, he caught her eye. Now she couldn't look away. The morning sunlight angling in from the windows caught the dips and hollows of his body, outlining every smooth line and heavy curve of muscle along his bare shoulders and chest. Her gaze followed the fine dusting of blond hair as it arrowed down his ridged abdomen then disappeared beneath the waistband of his breeches" (Page 86). I think I re-read that part about 5 times and then had to cool myself off. Can you say hot, hot, HOT?! Arek may just be THE hottest novel character I have ever had the pleasure of meeting. Maybe it's because on top of all his manliness, he is only human, so it is believable that there could be such a man out there. Either way, yum! I have to say, Allegiance Sworn was different than I thought it would be. For the most part, I could see where the story was going, but what I didn't expect was the emotion in this story. For some reason, Arek and Imhara's story just grabbed me by the heart and yanked. I felt their pain and loss and I understood what motivated them. They came from the same place and never were two people more suited to each other. In having a discussion with another librarian, I couldn't describe just how emotional this book was for me. It was so much deeper than the first two, I just wasn't expecting it. And the ending had me feeling desolate and alone and heartbroken. Needless to say, it was amazing. Never have I felt such a range of emotions while reading a book. When they hurt, I hurt. When they were touched, I was touched. When they felt empty, I felt empty. It was just profound. I loved it. So, thank you, Kylie. No one has ever done that to me before. It definitely gets a rating of 5 out of 5 stars! So, the moral of the story is, next Tuesday, April 2nd, get to your closest book store and buy Allegiance Sworn. And let me know what you thought. Also, don't forget that in just two days, Thursday, March 28th, Kylie will be doing an interview right here! Stop by and get entered to win some cool prizes!